Sometimes you just want to quilt the quilt yourself. For a variety of reasons, you may not have your own long arm quilter at home. But we have one in the store! After taking our simple introductory class and using your free practice session, you will be ready to begin tackling your projects. Bernina of Oklahoma City has a Bernina Long Arm on the floor ready for you to use. You will be out in the open, and we suggest you bring head phones and listen to music of your choice while you are quilting to help focus on your work and get a good rhythm. Introductory class is $30 and runs 2 – 2.5 hrs. Limit 4 students per class. After intro class we will schedule your first practice time on us. During this time, please quilt a non-heirloom, not particularly important quilt top to get used to the machine and free motion quilting on a long arm. Sign up for Class Here or Call for Appointments! Needles - You will need to purchase needles from Bernina of Oklahoma City for your rental time to ensure the needle is correct for our machine. We recommend that you change the needle every quilt and halfway through large quilts, for best results. Thread – We require that you use thread bought from Bernina of OKC. Please get your thread pre-approved before your rental time. This helps you have a smooth time, and we don’t waste any time with tension problems or thread breaks. Bobbins – Only Bernina Long Arm bobbins can be used on our rental machine. We sell packs of 5 or singles to get you started. It is a good idea to have at least 3, on a 60 x 60 throw size quilt you will most likely use 2 bobbins. Batting – You may purchase our batting or bring your own. We carry Warm and Natural 90” wide roll, Warm and Plush 90” wide roll, Kyoto Bamboo 90” wide roll, some wool, and a polyester (Usually the Warm and Co brand). Pantographs – Feel free to print or bring your own pantos to use with the rear panto handles and laser for doing edge to edge style quilting. The width of our frame is currently 109” for stitching so keep this in mind. Quilting time is scheduled in advance. No walk-ins please. If there is not another quilter pre-scheduled right after you, you can keep going for $12 an hour. If there is someone pre-scheduled after you, please remove your quilt from the frame and sign up for additional time another day. It is not difficult to put the quilt back on the frame and get repositioned to start up again later. Don’t stress! Quilt Valet Service: For an addition $20, we will set up the machine for you for the next morning. 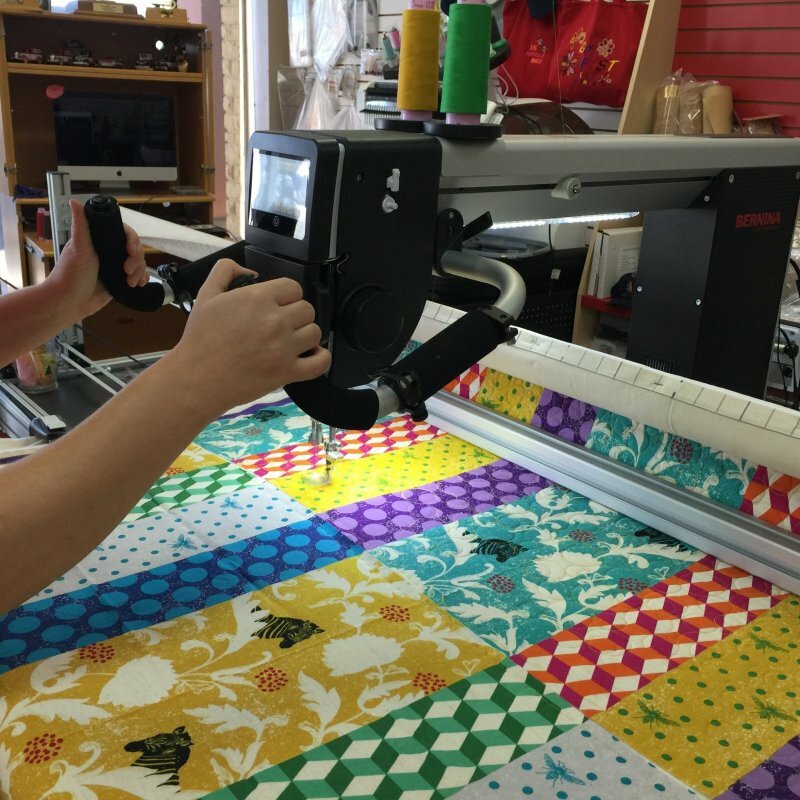 The quilt will be loaded, and the machine ready to sew for you when you arrive for your session starting at 10am. For valet service, please drop your quilt top and back off the night before. Back and batting must be a minimum of 4” larger than quilt top all the way around. 6” preferred. For your reference: A queen size quilt will take the average quilter 4-6 hours to quilt. If you sign up for the whole day you get the quilter to yourself, including the lunch break if you want, but only until 5:30. We need time to remove your quilt and close down for the day. The maximum width of the quit you can load on our frame is currently 109”. Payment is due on rental time when the quilting time is booked. Failure to cancel or "no shows" will get no refund. We understand that life happens, but please let us know because we don't want to worry about you.